Norm Wakefield is becoming a household name in the circles of d'Olyfboom Family Estate and Family Tree Leadership Academy. He is a seasoned speaker with many successful conferences and workshops under his belt but more importantly: he is an amazing father and just loves sharing his knowledge with fathers and mothers who are looking to make the most of parenthood. 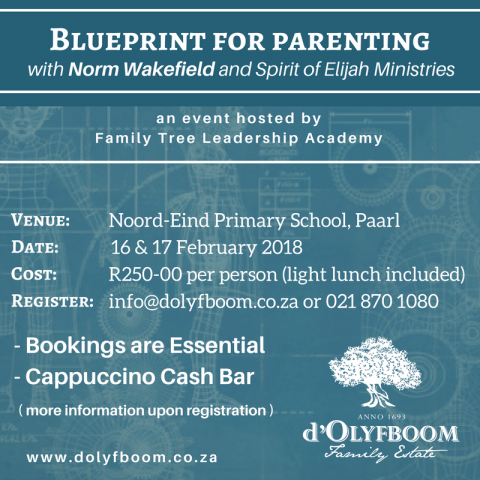 We are so privileged to have him return to d'Olyfboom Family Estate in February 2018 to facilitate "Blueprint for Parenting." Be sure to save the date and not to miss out on this wonderful event.